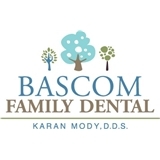 Bascom Family Dental (San Jose) - Book Appointment Online! There is a reason why they are called Bascom Family... they treat you like family. Never have a ever felt so welcomed, comforted at a dental office until now!!! Cindy is like the mama bear that soothes your fears and comforts you on the phone before you get there. Then the assistants are calm and thorough so help you through the process... Then it's Dr. Mody... he's just awesome! I couldn't have asked for a better place to get my teeth healthy and I can actually say I look forward to see them!